At his retreat at Garrison Institute earlier this year, Chokyi Nyima Rinpoche, with whom Tulku Sherdor has been fortunately and closely connected since 1981, graciously gave Blazing Wisdom Institute the opportunity to assist with his activities by appointing Tulku an Acharya (Loppon) in the Tara Triple Excellence (TTE) program. The TTE program affords people all over the world an opportunity to learn the entire Buddhist path through online tutorials, guided meditations, and video lectures given by Rinpoche and his senior students. It is, in that sense and others, a treasure revelation for these times. 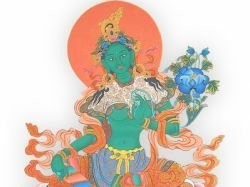 In a formal sense, the curriculum is based on the Zab Tig Drolma treasure cycle of Chokgyur Lingpa, which contains a complete presentation on the three vehicles of practice. The emphasis of the program, moreover, is on practical development and growth, and not theoretical understanding alone. As Rinpoche is fond of saying, "No train, no tame. No tame, no gain." Specifically, Rinpoche directed Tulku to offer live programs in the northeastern U.S. to supplement and complement the study and practice people do on their own through the online program. Similar live programs are being offered to the Rangjung Yeshe Gomde communities in Europe and at Leggett, California as well. While offering an opportunity to delve more deeply and with greater personal guidance into the subject matter of the TTE program, these short retreat programs are not strictly limited to those who are enrolled in the program online. New practitioners are most welcome. The first 'live' retreat program will be held the weekend of January 17-18, 2015, at BWI in Saugerties, NY. The focus will be on reorienting the mind toward the dharma through the foundational teachings of the First Excellence: What are faith and renunciation? How do we cultivate and stabilize these qualities of the path? and How do they benefit us? What are the defects of failing to do so? The retreat will provide time to meditate upon, contemplate, and discuss these questions in a supportive setting, including the support of one another's company. A few days after the retreat, Tulku will travel to Nepal and join Rinpoche, and will tell him about the New York area practice group and the live retreat. There is no charge by BWI for you to attend the program. You may make donations if you wish. In that regard, kindly review the Vision/Mission Statement and Virtuous Circles Statement at www.blazingwisdom.org.